Our charging station is located on the second floor and is available through our association with EBSCO, which also supplies several of our Electronic Resources. Do you have a mobile device that needs to be charged? There are five different types of charge cord; eight charge cords all together. We have 24 computers available for public access: 11 on the first floor, including two dedicated library catalog computers, and 13 on the second floor, including two iMac computers purchased by the Friends of the Library. No login is required and there is no time limit for using computers at our library. Please know that you are bound by our Computer Use Policy when using our computers or library Wi-Fi. The policy is available at the above link and is posted in printed form throughout the library. Our fax machine is on the first floor, near the Circulation desk. It is available for public use. Ask library staff if you need any help. The charge to send a fax is $1.00 for the first page and .50 cents for each subsequent page. The charge to receive a fax is .50 cents per page. The number for our fax machine is 978-468-5535. Our microfilm reader is available for public use on the second floor. It is a ScanPro 2000 and can be used to make print copies, or to create PDFs or images for emailing or personal storage to a flash drive. You are welcome to bring your own microfilm or microfiche for use with the ScanPro, or ask library staff for access to our microfilm collection of back issues for the Hamilton-Wenham Chronicle from 1958 to the present. Wireless black and white printing is available in the library. You will need to register first at OCS Web Print, so please have a valid email address ready. Once you have registered, your go-to URL for wireless printing will be the Hamilton-Wenham Library wireless printing site. If you are using a phone or other mobile device, you may find easier to email your print job as an attachment to bwletter1@ocsinc.ca, but the email address you send from must be registered for your print job to be accepted. Your wireless printing registration lasts beyond a one-time use, so return to this site or email bwletter1@ocsinc.ca whenever you like with further print jobs. Please ask staff if you need any help printing or registering to print wirelessly, or consult this illustrated wireless printing handout. You can email files to yourself or save them to a flash drive and use one of our public access computers to print. We have two scanners on the second floor: a gray flatbed Epson and a black ScanSnap. They are attached to computers located behind the Reference desk, and only scan to these separate computers. The Epson and the Scansnap each work differently, so please ask at the Reference desk if you need help using either scanner. There is no charge for scanning at our library, only for printing or copying. Our 3-D Printer is a MakerBot Replicator 2, purchased for us by the Friends of the Library and available for public instruction and use. Please ask at the Reference desk or call 978-468-5577, ext. 19 to schedule a time for printing at the library. Patrons who wish to print must have a valid library card, agree to comply with the User Agreement, show staff the .STL file to be printed, and include a description of the project to be printed. Patrons under 18 should be accompanied by a supervising adult. Users agree to pay a materials fee of $3.00 for standard print jobs. Jobs using large amounts of materials will require a $5.00 fee. All items must print within normal library hours. Ask at the Reference desk to find out more about the User Agreement and printing 3-D objects at the library. Our library telescope is an Orion StarBlast 4.5 Astro Reflector Telescope, and it is available to check out, advance reservation only, by patrons with current library cards in good standing. The circulation period is five days, with initial check-out on a Thursday and check-in the following Tuesday. Please read our Telescope Lending Program brochure and contact 978-468-5577 for more information about borrowing our library telescope. There is a typewriter available on our second floor. If you need any help getting started with the typewriter, just ask staff. We can set you up and lend you the manual if you want it. This is a powerful magnifying device that you can use for reading. It is for public use on the second floor and is made available by the Lions Club. Ask staff if you need any help using it. Yes, the library offers wireless “wi-fi” access for users with properly equipped laptops and mobile devices. It is available on both floors. Ask a librarian for help if you experience any difficulties with library wi-fi. Click here for our Wireless Access Point Policy. 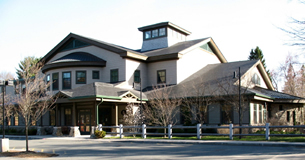 When you use the Internet in the Hamilton-Wenham Library, you are accepting the library’s Computer Use and Internet Policy. Please take the time to read the policy before accessing the network. For wireless printing, please see under the section for Printers.